Twitter Tip: Why are my tweets not being seen? Moments ago at a red-carpet press event in NYC, SodaStream announced their partnership with Scarlett Johansson. As the company's first global Brand Ambassador, Johansson will star in the company's highly-anticipated SuperBowl XLVIII commercial scheduled to air during fourth quarter. Johannson, who has been a SodaStream customer for 7 years, said she's happy she can have a party and not have trash bags filled with soda bottles. She also loves that beverages made with SodaStream have no high-fructose corn syrup or aspartame and that extra bubbles can be added. SodaStream is the world's largest manufacturer, distributor and marketer of home carbonation systems which turn water into carbonated flavored beverages saving the planet millions of plastic bottles a year. Pictured above is the Source which retails for $99.95. We'll all be tuning in to see what the creative team at SodaStream has come up with for this year's big game on February 2. 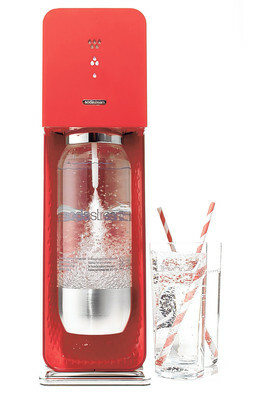 Visit SodaStream at sodastream.com and "If you love bubbles, set them free".